Still having trouble getting iCX sensors to show. I'm on version 5.88-3510 and can't get the 1080 Ti FTW3 iCX sensors to show at all. Have tried clearing the GPU I2C Cache with no luck. Anything else I can try? Please attach the HWiNFO Debug File for analysis. Does the EVGA ICX software work and show those sensors? And if you run HWiNFO after the EVGA software does it show it then? 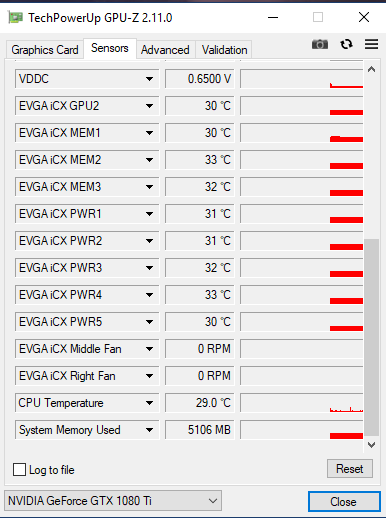 The EVGA ICX software does show the various sensor readings. Launching HWiNFO after EVGA PXOC does not make the sensors show either.. Could a reinstall of HWiNFO help? Or perhaps a reinstall of PXOC? I don't think that reinstalling HWiNFO will help. I'm not sure why this happenes, ICX is a proprietary technology that EVGA probably doesn't want to be accessed by anyone else, so they might have implemented some additional features that block other applications from using it. Is any other tools besides EVGA able to access those sensors? I know that AIDA64 and GPU-Z were able to show them. Yes, those settings look OK. Try also to disable "GPU I2C Caching" if that will change something. Does AIDA64 show ICX sensors too? I'm not sure where exactly to look in Aida but I can't see them anywhere. I don't think that reverting back will help. Please create a nVIDIA SMBus Dump using AIDA64 and attach it here (right-click on the bottom status bar -> Video Debug -> nVIDIA SMBus Dump. I'm not seeing a bottom status bar in Aida 64... I only have the eval, is that a problem? Sorry status bar wasn't enabled. Not a lot of info, is this what you need? Thanks. AIDA64 didn't find anything. One more question - which sensor values are available on this GPU? 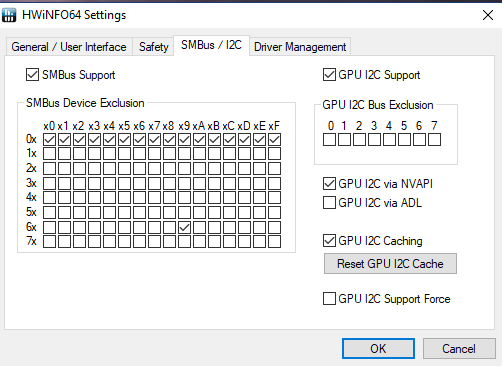 Can you please post a screenshot from EVGA tool or GPU-Z ? and attach a new Debug File created using that build. (09-24-2018, 01:02 PM)Martin Wrote: Thanks. AIDA64 didn't find anything. Thanks. That tells me something, let's make another test. and let me know if it maybe shows something. Also please attach a new Debug File. (09-25-2018, 07:13 AM)Martin Wrote: Thanks. That tells me something, let's make another test. Cool, what does it say? Here is the Debug from 589_3518. Current time: 04-21-2019, 01:55 PM Powered By MyBB, © 2002-2019 MyBB Group.